Watch Novogodniy Goluboy Ogonyok – Russian New Year Blue Light 2016 (all night New Year entertainment: music, humor, parody, satire, variety). Rus: Новогодний голубой огонек 2016. This particular show, which I remember since I was a toddler, runs throughout all of New Year’s night – something like 5+ hours of pure entertainment, including stars of various genres and ages. Program is varied and includes classics, pop, Russian folk, dance and songs. There is a lot of parody and humor, usually sprinkled with light self-irony and entertaining current affairs satire. Often, old songs are given a face lift with new and funny lyrics that showcase well-known classic tunes in a humorously updated light. I think Goluboy Ogonyok has been around since before I was born. It’s undoubtedly one of the longest running shows on the planet, if not THE longest. But every year it reinvents itself, upping the plank for jolly music, humor, parody and satire. Its audience is far beyond Russia. The best news, those of us who don’t have access to it on TV, can catch it on YT. Goluboy Ogonyok is just one of the New Year’s lavish and flamboyant entertainment programs to help Russians and the entire Russian World to welcome the New Year in style. There is also First Night, First Day, Second Day, New Year’s Two Stars, New Year’s Star Parade, Song of the Year, KVN, various themed shows and musicals, etc, etc. Conclusion: Russians stay thoroughly entertained throughout the entire New Year’s season. They need it, poor things! 😉 The official country-wide break it till January 10 when the whole country takes off to celebrate! There are tons of parties and various live events as well. In short, Russians are really, really spoiled that way. Anywhere in the West you could literally die of boredom throughout Christmas/New Year’s since there is absolutely nothing to do and everything everywhere is closed. Or you pay through the nose – and that’s no guarantee of quality either! The traditional opening song is a parody on the classic song ‘Five Minutes’ from the 1956 Russian classic New Year’s musicale comedy film “Carnival Night” – the new lyrics for it is written every year. Dont’ miss this one! Song three is a hilarious parody with Angela Merkel’s look-alike, set to a well-known score from the same film “Carnival Night.” Watch at 8:35. The lyrics and acting are poignantly funny. Merkel’s likeness is rather scary. Playing off the fact that she speaks Russian, Angela sings how busy German Chancellor’s year is and that she’s arrived to catch a break in Russia for New Year’s. The boys respond, with usual Russian hospitality, that she is welcome. Angela is asked whether she’d like a traditional Russian present from Ded Moroz’s sack, or from a Western stocking. She acts demurely, pretending she doesn’t want any and says EU’s goal is to teach Russia real European values. Yes, goes on Angela, I do believe in European values, but I think I’ll take the whole presents’ sack anyway. “La, la, la, la, la, how rich is Russian land,” sing the boys. On second thought, says Angela, I think I want the stocking, too. Then Angela is asked if she’d like to drink vodka or champagne. She picks champagne because, she says, ‘it contains Russian gas.’ She’s very disappointed when she finds out that champagne contains no Russian oil, gas, nor other natural resources. How are you doing as a result of anti-Russian sanctions, asks Angela. “We’re paying Russian cash,” reply the boys. “We’re happy to see all our guests and share our joy with all for real, not on credit. La, la, la, la, la, la – not for profit, but for fun.” “This can’t be!” replies Angela. “Believe it or not, it does!” sing the boys. “Enough boring topics,” says Angela. “I came to Russian because you are much more fun. Let me play this merry tune for you.” Plays balalaika and dances. Cute number at 23:40 featuring singer Vaenga and famous ballet dancer Tsiskaridze, combining song and a bit of ballet. Check out all three parts of this all-night show! How Russians Celebrate New Year: Happy NY 2014! 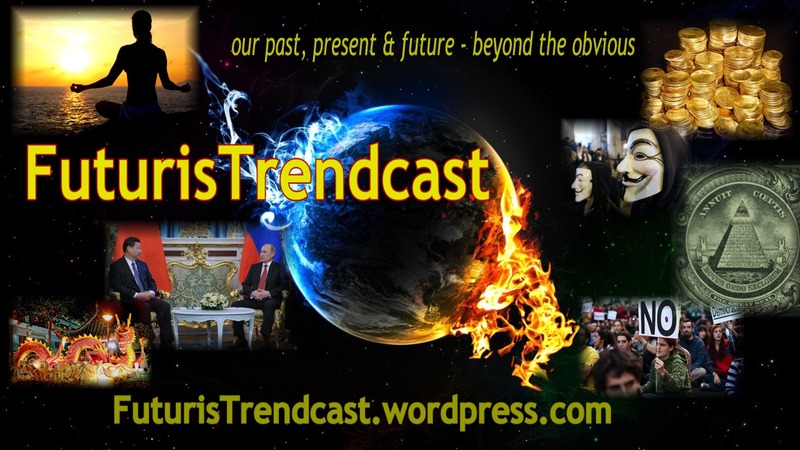 Happy Holidays from FuturisTrendcast and Earth Shift Report!